Ever since I was 2 1/2 years old, having “spresso and cookies” with my dad, before anyone else in the house was up, has been a weekend tradition. Today, I still like to have something sweet with my coffee on the weekends, and one of my go-to recipes is this one for scones. I’ve been making these scones since middle school home economics. They only take about 15-20 minutes, so it’s easy to make them on Thursday or Friday night and have delicious scones to enjoy all weekend. 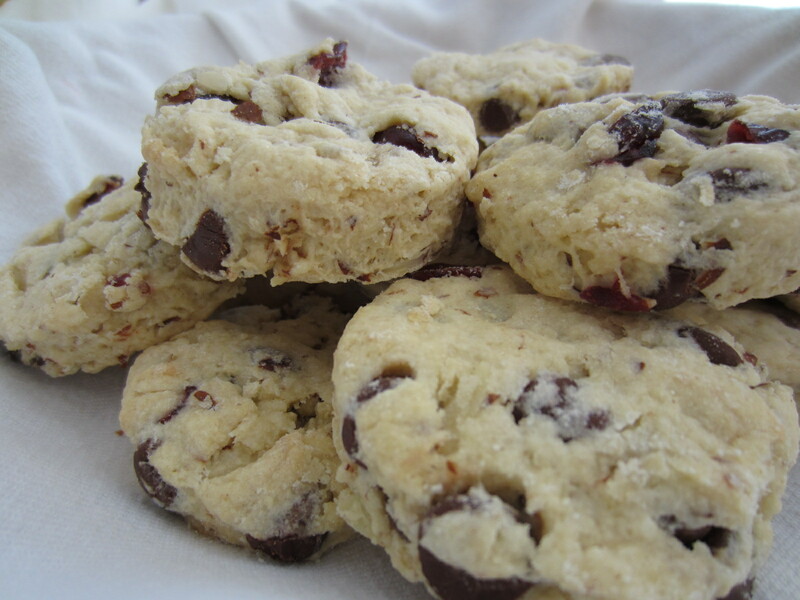 I usually make them with chocolate chips, slivered almonds and dried cranberries, but you can use the recipe as a base and experiment with any type of nut, fruit or other ingredient. Also, if you’re health conscious but sill like to indulge in the occasional treat, you can use a smaller round object to cut the scones (my tool of choice is a martini shaker lid to make mini scones). Preheat oven to 400 degrees Fahrenheit. Lightly spray a baking sheet with non-stick cooking spray. In a large bowl, whisk the flour, sugar, baking powder and salt. With a pastry blender or a large fork, cut in the butter to make coarse crumbs. (Tip: Make sure the butter is well chilled to produce the flakiest texture.) 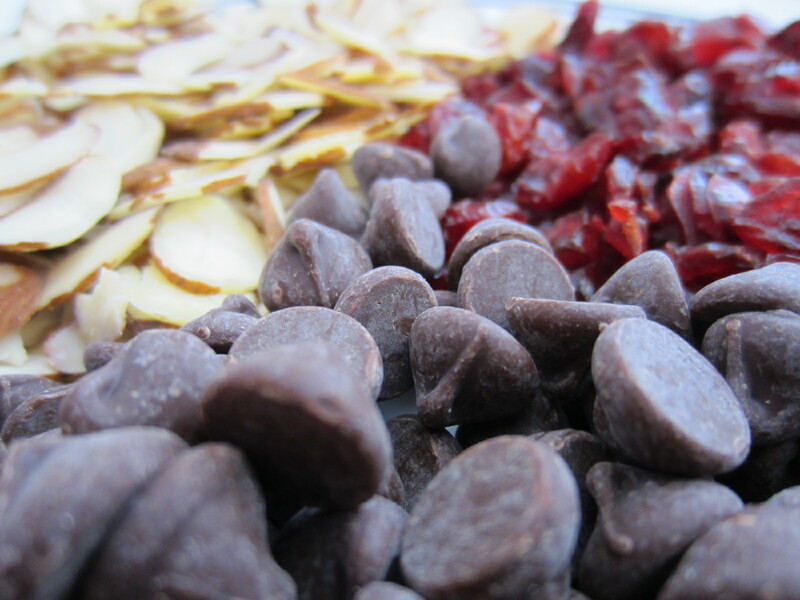 Stir in the chocolate chips, almonds and cranberries. Mix in the orange juice to form a dough. If the dough does not stick together and is still crumbly, add more orange juice, just a splash at a time. If the dough becomes too sticky, add more flour. Transfer the scones to the baking sheet and bake until golden brown, about 12 minutes. Cool on wire racks. 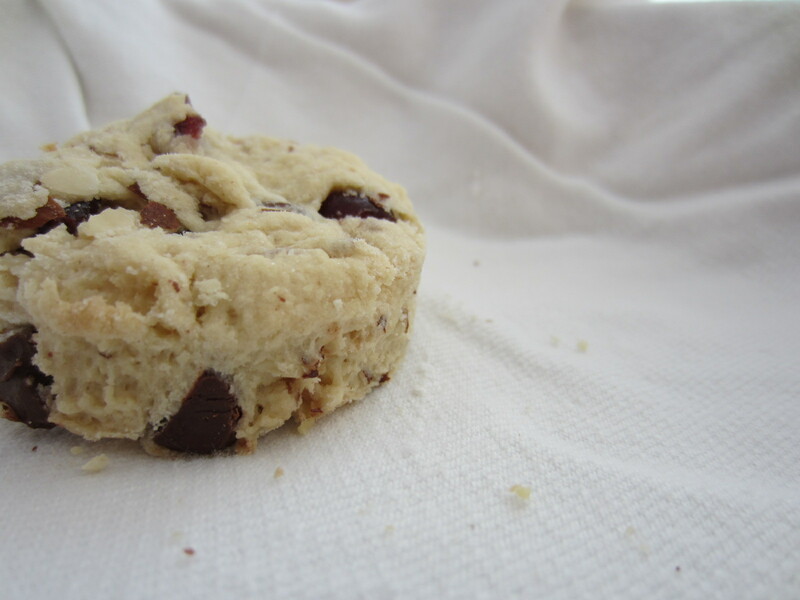 Experiment with different nuts, fruit or other ingredients in your scones. This is a recipe I’ll have to try. They look so delicious! Thanks megtraveling, you’ll have to let me know what you think!